Gay News ® is Holland's independent dutch gay magazine, and coming out since 1992, published monthly continiously, and has the same publisher for over 20 years. With all that experience, Gay News has more knowledge and a better understanding of the target audience then available anywhere in Holland. Content wise, Gay News is unique for it's mixture of serious to light editorial content, making it's content accessible for readers of all levels. Like our websites, Gay News magazine is (nearly) totally bilingual (both in English and Dutch), reaching the maximum potential of it's gay audience. Advertising in Gay News is very affordable. Gay News is unique for, as a mostly freely distributed magazine, it's mix of light to serious editorial content, offering accessibility on all levels: Gay News has a mixture of easy to read pieces with very well-researched articles. Furthermore Gay News is the only totally independent gay medium in Holland. Advertising in Gay News magazine is not only very affordable, but also gets you an enormous internet support, because our websites are totally bilingual (in both English and Dutch), unlike any other dutch gay magazine ever could, getting you the biggest gay audience available in the Netherlands and it's visitors. Because we deliver our content spread over more then 30 domains, we are able to offer a targeted audience, which goes further then just the word 'gay'. Gay News furthermore does much more for her advertisers then 'just printing your add', as Gay News is part of a strong combination with a massive international and travelling webcommunity (which formed since 1995) and the yearly Amsterdam Gay Map (which nearly every tourist in Amsterdam uses). Gay News has a unique two-step distribution, like many mainstream gay media in countries like Germany and the US. Gay News is mainly distributed for free in gay businesses in the urban agglomeration in the Netherlands & in Belgium in Antwerp. With more then 20 years of experience we know where it is usefull to distribute and where it is not. As we only distribute on places with at least a 95% reach, your add is seen, and rates can be kept affordable. 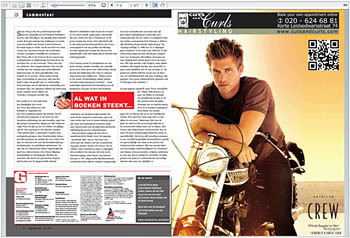 Content wise, Gay News focusses mainly upon our targeted audience, gay people in the Netherlands and it's visitors. Because we are home to some of the reknown gay Dutch authors, some are even included in the Library of Congress in the US, Gay News can offer a combination of editorial content at all levels, making Gay News appeal to a wide range of the targeted audience. The average Gay News reader is the gay population between av. 25 and 48 years; this is also the most spending and travelling part of the gay population. Because of it's entire bilinguality (both English and Dutch), the international gay audience, such as tourists and people stationed here for work by international companies is also reached; on the other hand, subscribers are seen all over the country. With the professional, quiet design, your advertisement always gets the attention it deserves. Gay News has been present on the internet since 1995; because our websites are in the care of a seperate foundation, you can benefit from the more then 40 domains she controls, amongst them are gayamsterdam.com|.nl, gaycity.nl and many other. Because of the many different domains and site-sections, we can offer a targeted audience reaching further and more specific then just the word 'gay', where also (anonymised) click-tracking is available. With our Assistant you can easily, simple, and without any obligations whatsoever, calculate through various options what advertising in Gay News might cost; because you save the cost of a sales person having to visit you, you can benefit yourself from our best, direct rates (on average saving around 30%). And should you have any questions, just email us at sales@ gaynews.nl. We are more then happy to help you further and get the most out of targeting the gay audience. you can use our Customer Management Interface, to place agenda items on both our websites and in print, your additions are automatically included in the printed agenda's of Gay News, which means we also print, apart from your add, your flyers in color. In our online agenda sections your flyer is displayed nearly full size. requirement to be able to bill without VAT is that we need to have your VAT number on file, and it has to be validated by us.